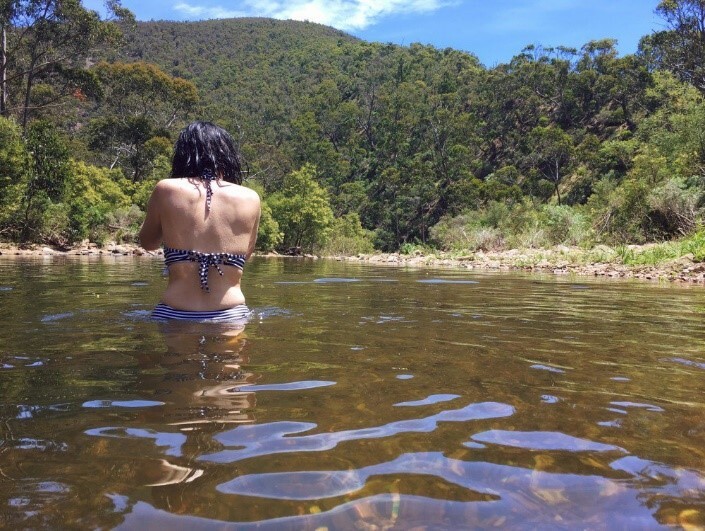 Freshwater swimming holes are Mother Nature’s alternative to the beach on a hot summer’s day and a way of avoiding crowded beaches, jellyfish and sharks! 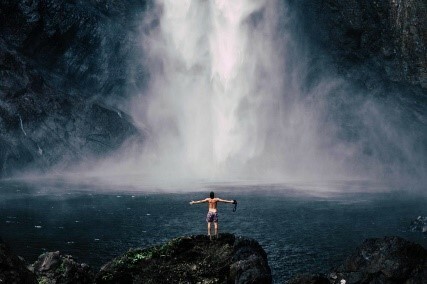 The sound of running water can be your secret to happiness, as you listen to tumbling waterfalls and float in the ‘au naturel’ swimming holes below. 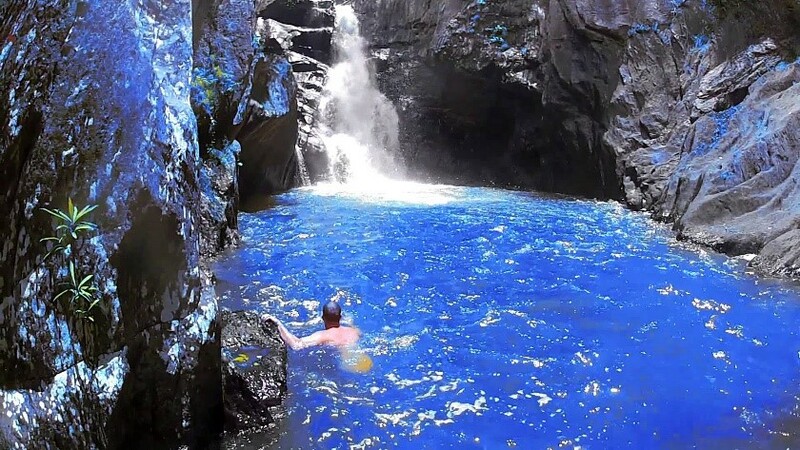 These tranquil settings, surrounded by lush bush greenery or rugged rock, without getting annoying ‘sand-in-your-togs’ moments, can be experienced at a vast number of stunning swimming holes in Australia. 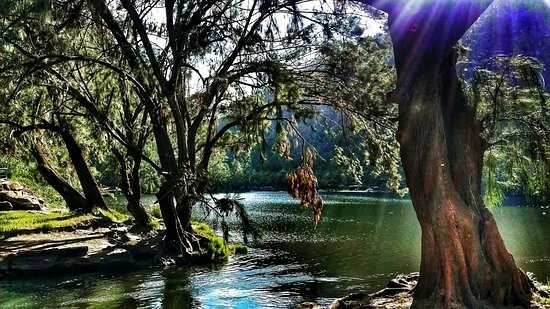 Whether you want to wash off the stress of the city and get away from it all, or break up a long journey, or simple want to play in the outdoors the way nature intended any of these epic swimming holes will be more refreshing than a cold beer! This sub –tropical oasis is a swimming hole that is at the base of the Serenity Falls deep within 45 hectares of the Buderim Forest Park. This secluded waterfall can be accessed by taking the rainforest’s walking tracks leading to the fall. There is a world far away from the beach and the Buderim Township nearby. Paddle under the gentle trickle of water in the dry season, or swim as the cascading water as it rushes over the ledge if it has recently rained. The falls can be viewed at the nearby Serenity Falls Bridge which gives an ideal vantage point. Serenity Falls has shallow caves and giant boulders as well as deep rock pools for wallowing! 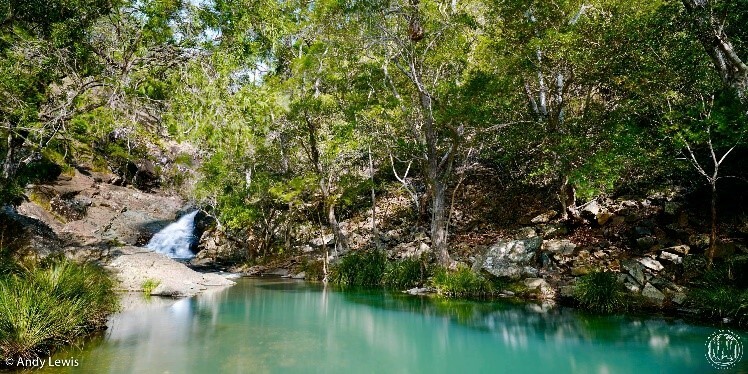 Just outside the hilly surrounds of Samford village, a 45 minute drive north-west of Brisbane, are the serene waters of Cedar Creek (not to be confused with Cedar Creek Falls at Mt Tamborine). 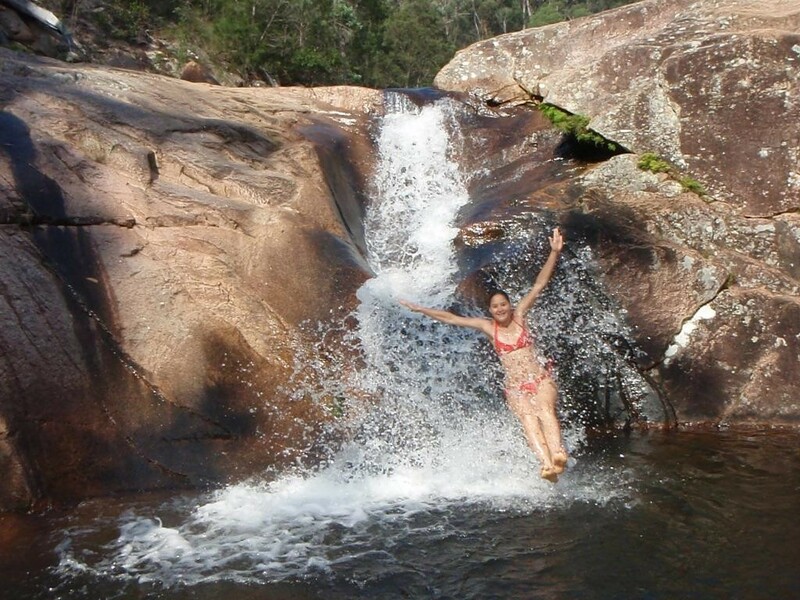 Cedar Creek’s trickling rock pools, flowing waterfalls and natural swimming holes are situated beneath the hilly surrounds of Mt Glorious. Rustling leaves, trickling water, and the bird calls as well as hours of exploring the rock pools, make this a favourite place for Brisbane families. 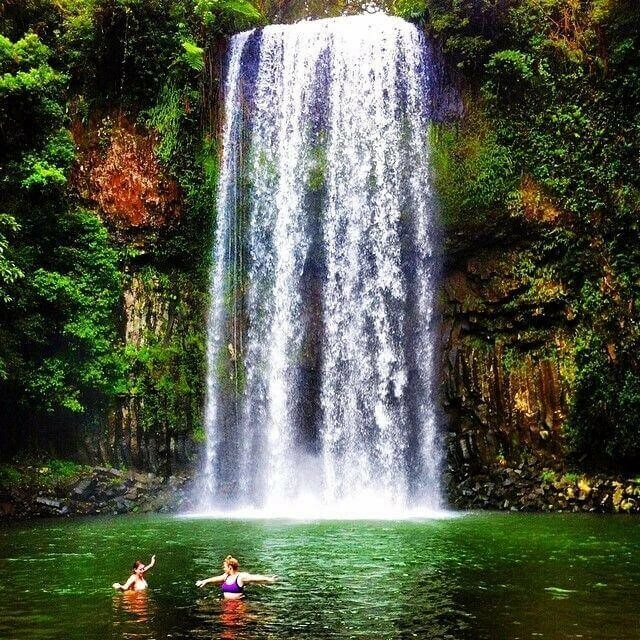 Located just outside Maleny, is another hinterland gem, Gardners Falls. A popular freshwater swim spot for a hot summer’s day. These delightful waters around the main waterfall and swimming area have two rope swings for the adventurous type who want to imitate Tarzan! If you are sitting around the edges in the shade of the natural. Creek rock pool you can dangle your feet in the water and be surprised by the friendly eels who may nibble your feet! The rock pool is backed by native forest and perfect for a snooze or a picnic. The peace and tranquillity at Wappa Falls is found only 5 minutes from Yandina and just a short walk from Wappa Dam. 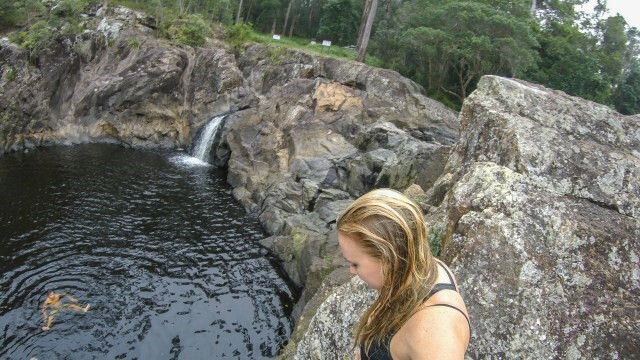 Wappa Falls is a natural mixture of rock formations and small rock pools around a gorgeous wild swimming hole. After heavy rain the waterfall gushes fiercely and caution has to be exercised as the rocks are very slippery. Warning signs telling people to use common sense when jumping from the high rocks above the falls, into the pool as people have died when there is fast flowing water and the river is in flood. The video below shows you how dangerous the fast water can be. Josephine Falls in Wooroonooran National Park is ranked amongst some of the most beautiful waterfalls in Tropical North Queensland. The action of water wearing the granite rock down over the years has formed a smooth flat surface which the water runs over, makes a naturally constructed water slide which is a whole lot of fun to slide down! You can relax in the crystal clear water or on the small sandy beach listening to the rustling of leaves from the overhead rainforest. No one is allowed to swim in the top pool due to the extremely slippery rocks and rapids just under the pool, so this area is fenced off but the cascades of water can be viewed from the viewing platform. The bottom pool below the slide has a large swimming hole with varying depths and is the best spot to swim. The heritage listed Millaa Millaa Falls is a plunge waterfall that is 18.3 metres high with the base of the falls being a great swimming spot. Set in the lush rainforest of Wooroonooran National Park, it is about a 90 minute drive from Cairns. Millaa Milla is an Aboriginal phrase meaning “plenty of water” and when following the walking circuit in the area you pass five water falls. Surrounded by tropical ferns and vividly coloured flowers you can watch carefully for the electric blue Ulysses butterfly as well as keeping an eye out for the odd platypus or two frolicking in the water! 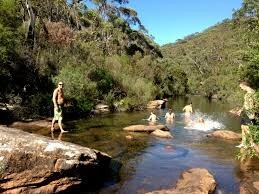 In this sheltered freshwater swimming hole there is a series of small waterholes which flow into a larger pools surrounded by majestic granite boulders. Hidden in this tropical rainforest are rock slides for you to slide down to the crystal clear waters, surrounded by overhanging trees. There are several cliff jumps into the creek, but they are formally off limits and actually quite dangerous. There are several pools where you can swim some are shallower than others. Near the Crystal Cascades, involving a steep climb over boulders is a deep plunge pool called Fairy Falls which is hidden from sight by high walls but well worth a visit. 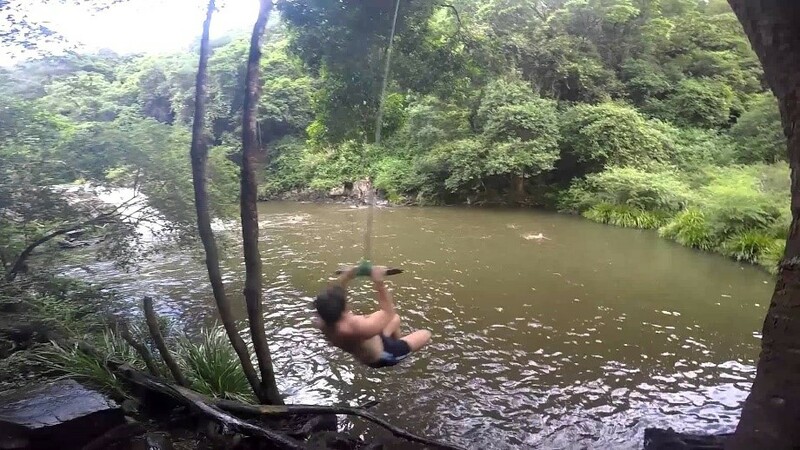 Just 10 minutes outside Ballina, sitting within a basin amidst a rainforest gully under a majestic 10m waterfall is the large swimming hole of Killen Falls. There are some deep sections towards the middle which are suitable for swimming, as well as shallower areas and many submerged rocks. The rock has been eroded behind the waterfall to form an exciting cave which you can retreat in and watch the water gush down in front of you without getting wet! Even though the main roads are close the swimming hole is well hidden and perfect for finding a spot to catch a nap and feel you are in the middle of the bush! Karloo Pools can only be reached by taking an 11 kilometre walking track through the impressive heathland of the Royal National Park. 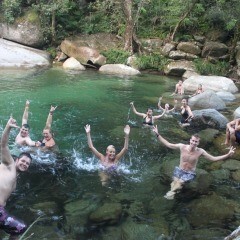 As you descend into the large clear emerald waters of the natural swimming hole the 1 hour walk will be worth it! Karloo is a stunning oasis perfect for a swim and surrounded by a large rock platform with plenty of room to pull out your sunbathing towel or picnic. 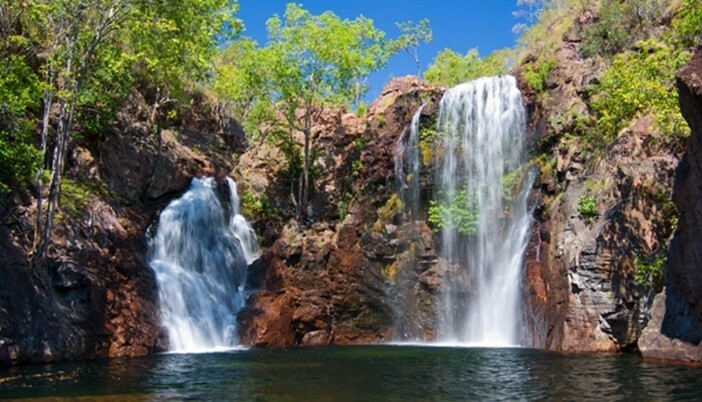 To complete the adventure you can follow the Uloola walking track to the gorgeous Uloola Falls which is another picturesque place to relax and take in the surroundings. 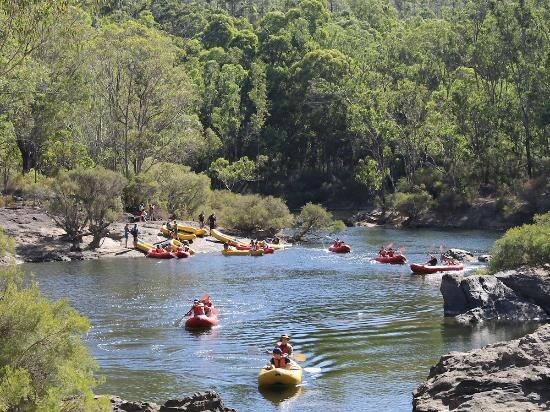 Bents Basin is one of the deepest swimming holes in New South Wales, lying downstream from the Bents Basin sandstone gorge and part of the Nepean River. Bents Basin has rapids so you can spend your day throwing down them successfully with just the right amount of control. As a well-established National Park site it is a good place to swim, picnic and relax on the grass as there are spots where you can be in the full sun or shade. The large grassy flats can be used to play frisbee, soccer or volleyball. Upstream past the moderate rapids are some smaller rock pools. 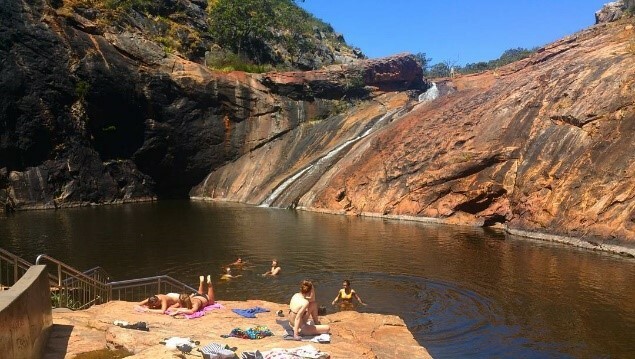 Mubulla Creek Falls in Biamanga National Park is a rock pool with a built in natural rock water slide, with its lip at the bottom to launch yourself into a deep pool. To reach the top slide is a scramble up the rocks on to the right of the falls. Once at the top you can either jump off the rock ledge or push yourself onto the rock slide for an invigorating ride! If you choose not to risk injury it is still a great spot to wallow as there are a couple of deep pools and the water looks so clean you could drink it! Here is a video that captures the joy of sliding and jumping into the Mumbulla Creek Falls. This hidden gem is found in the Blue Mountains National Park near Glenbrook. Jellybean track is a short walk past beautiful flora and fauna, taking you to the pretty Jellybean Pool. Shaped as the sugary treat, the waters of this gorgeous natural pool are a distinct colour! Although it looks dirty, its discolouration coming from the native gums dropping their leaves into the water at the sides of the river. There is a sandy embankment for children to play on and the pool is flanked by sandstone cliffs. Under one hour’s drive from Melbourne Lerderderg River has carved a 300m gorge through the sandstone and slate. There you can find a beautiful rare oasis surrounded by native bushland and sweet smelling country air. There is a grassy, shady area near Mackenzies Flat suitable for picnics. Visiting the gorge in late summer or early autumn is best before the river typically dries up. Laughing Waters in Eltham in Warrandyte State Park gets its name from the gurgling rapids of the Yarra River. 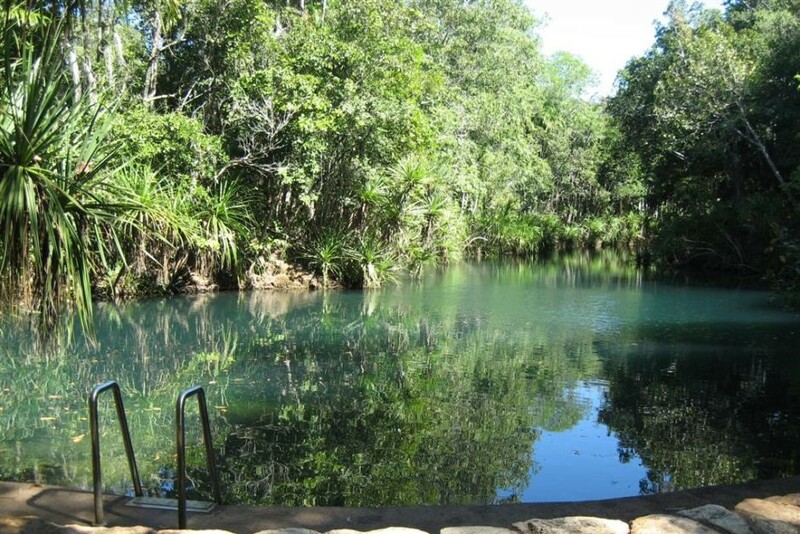 This extremely picturesque pool is more secluded than many other swimming holes and is surrounded by the peace and quiet of the surrounding bush. The area is a series of wide deep pools separated by these bubbling rapids. Although slightly silty, the pools can be waded and feels like a natural spa with the gentle current moving along. Werribee Gorge is just over an hour’s drive from Melbourne. Blackwood Pool is the gorge’s largest swimming holes on the Werribee River. 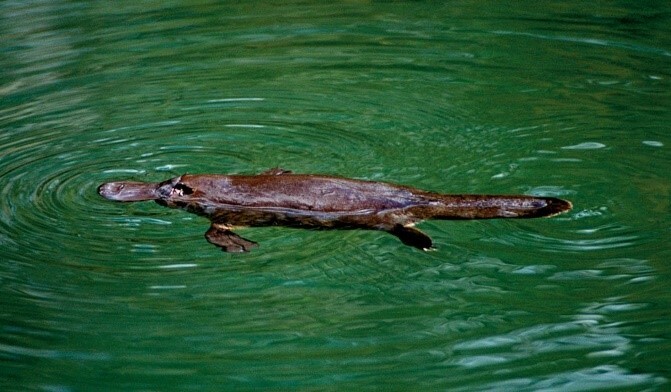 As home to the native platypus, there will be plenty of opportunities to come face to face with one. A boardwalk and gravel walk trail surrounds the perimeter of the pool and there are lots of trekking opportunities along the Werribee River with more opportunities to take in nature. Pound Bend is in the Warrandyte National Park Reserve near Melbourne. 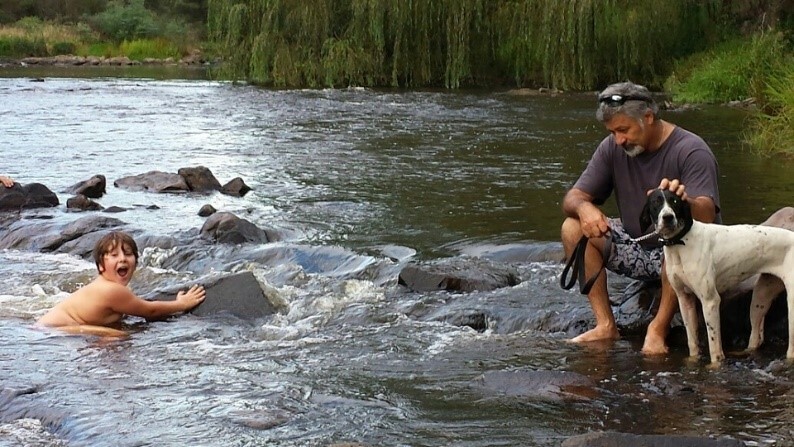 This delightful naturally occurring swimming hole is a rock pool at the outlet of a tunnel on the Yarra River. The tunnel was constructed in the late 19th century to change the course of the Yarra River as it bends in a loop, so that miners could dredge the exposed horseshoe for gold. 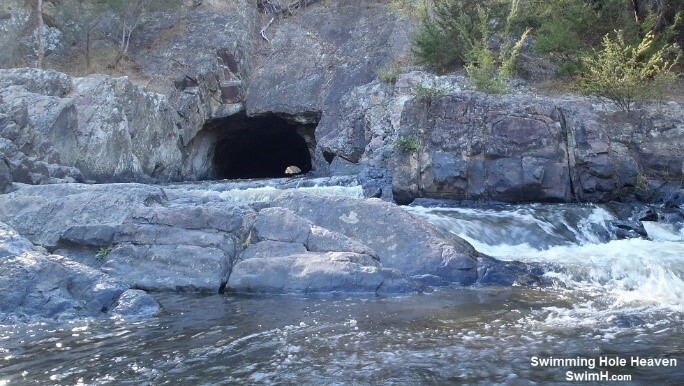 The set of rapids at the tunnel outlet means you can lay in the water and let the water rush past you as if you were in a spa, providing a relief for aching bones and ailing muscles. For those swimmers who prefer a calmer swim there are shallower pools nearby. 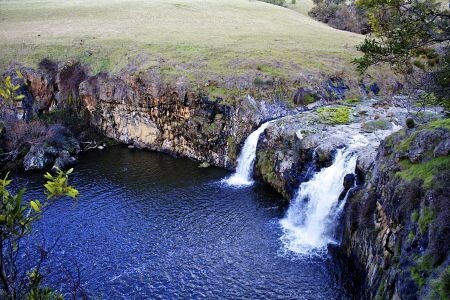 About 100kms North West of Melbourne, tucked away among rolling hills and farmland is the large yet tranquil swimming hole, Turpin Falls. Fed by the Campaspe River it is surrounded by a huge semi-circular rock wall. This splendid peaceful location has cold water to cool yourself on a hot day and the added bonus of being able to swim under the waterfall itself as it cascades over the rock into the secluded pool. There are boulders and rocks which make perfect natural seats for basking in the sun or for climbing and exploring. Jumping off the rock is strictly prohibited and access to the spot is narrow and not well maintained. 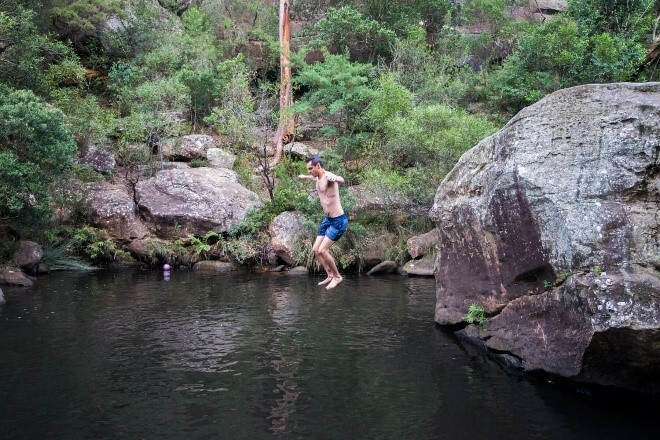 South Australia is one of the driest inhabited continents of the world so it is less fortunate in numbers when it comes to discovering swimming holes. In the spectacular Onkaparinga Gorge in the Onkaparinga River Nationa Park is one of the national parks best kept secrets. This breath taking rock pool is surrounded by overhanging steep rocks creating an oasis of tranquillity to relax in. Whilst indulging in the rock pool you may be lucky enough to spot the medium sized bird of prey, the Brown Goshawk. Wherever you go in this park as well as birdwatching you be able to see native wildlife such as kangaroos, koalas, possums and even the odd echidna! If you like the challenge of driving a long distance on rough roads and have spare tyres in the boot this is the place for you. A 21 hours from Adelaide in the Witjira National Park, at the one of the edges of the Simpson Desert, is the hot spring oasis of Dalhousie Springs. The area has been used for many years by Aboriginal people as a source of food, medicine and shelter. This popular rest bite from desert conditions offers a 38-degree hot spring experience and is worth it just to see water in the desert! 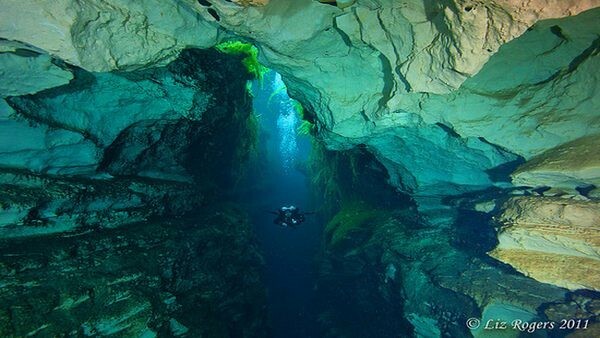 Ewens Ponds is a group of 3 water filled sink holes on South Australia’s Limestone Coast, just south of Mt Gambier. These spring fed, freshwater limestone ponds create a rare underwater environment which holds plants that are not found anywhere else in the world. No more than 10m deep and with an underwater visibility of up to 80m this spot is a special place for snorkelling and qualified divers. Wetsuits are recommended due to the coldness of the water if diving. Residents like the pygmy perch, short finned eels and freshwater crayfish are to be seen in the impressive underwater garden. On the coastal border between South Australia and Victoria Piccaninnie Ponds is again a cold water swimming hole where very thick wetsuits are needed if you go deeper. The freshwater rising to the surface and slowly filtering through the limestone forms The Chasm and also a large underwater cavern known as the Cathedral. 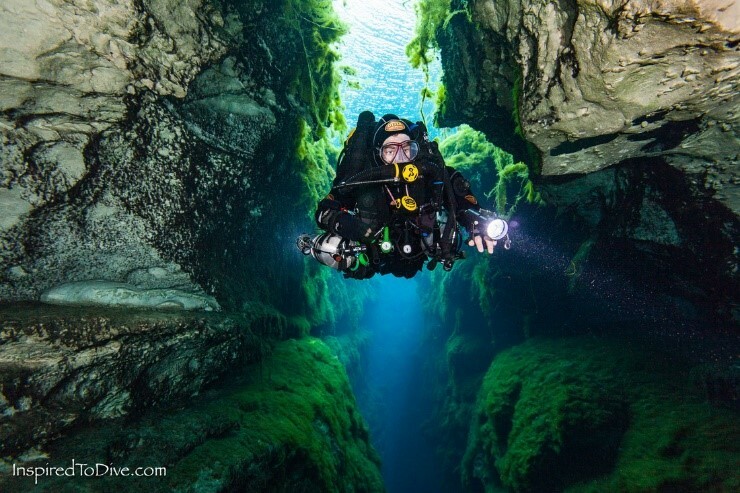 This is a diving opportunity to discover another spectacular underwater world. The crystals clear waters allow you to peer down the dark depths with breath taking underwater views of the majestic white walls of sculptured limestone in The Cathedral cavern. Note that if you plan to dive or snorkel you will need a permit from the National Parks South Australia. 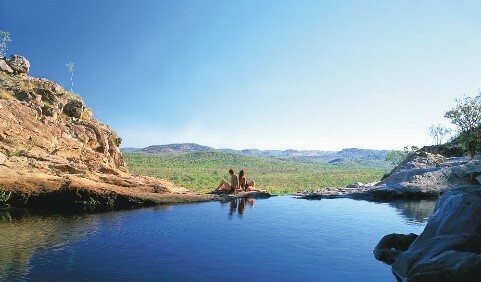 The Northern Territory holds some of the most remote and stunning waterholes in the country. 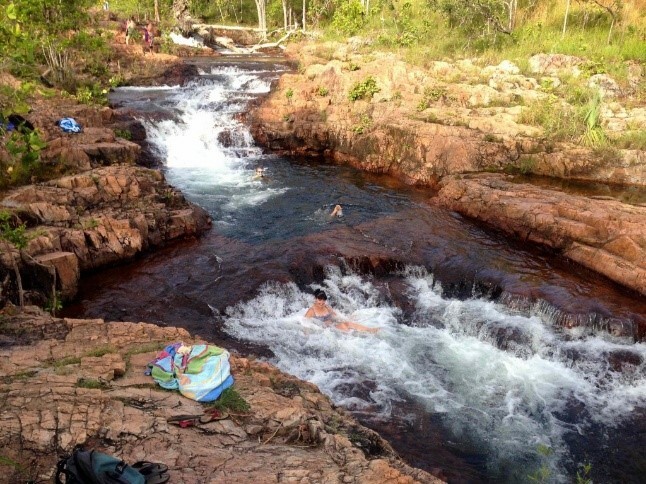 Berry Springs is an idyllic outdoor haven is just outside Darwin. Fed by crystal clear spring water and a large warm underground spring the area has three natural pools beginning with a small waterfall and finishing with a small weir. 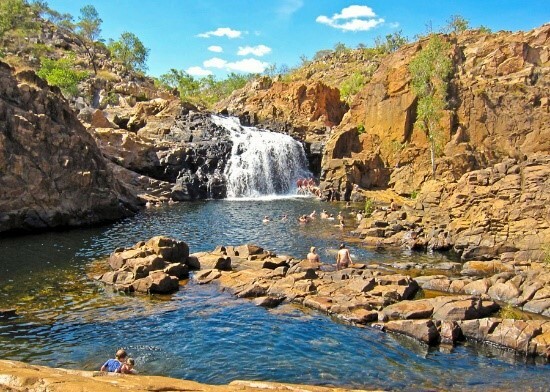 In the magnificent Litchfield National Park, Buley Rockhole has a series of waterfalls and rock holes. You can find your own spot to relax and swim taking in the bush surroundings and the unique rock shelves. Florence Falls is a clear deep and shady place to swim and is surrounded by towering rock walls. Nearby Wangi Falls gives you an escape from the humidity in the dry season, but in the wet season the water flows too rapidly and are dangerous. 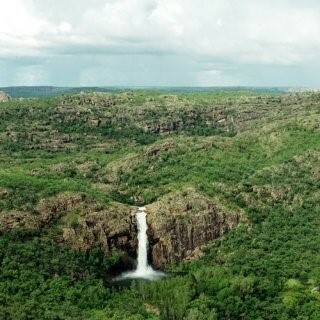 Gunlom Falls is located on Waterfall Creek in the southern part of the World Heritage Kakadu National Park. 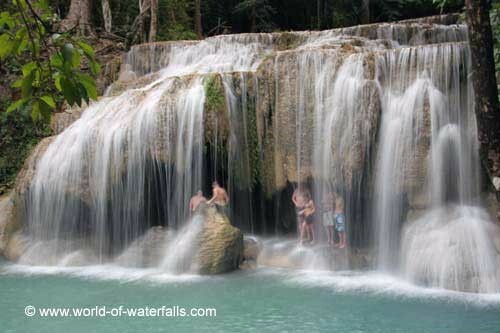 Visiting Gunlom you will find a delightful combination of waterfall and tranquil plunge pool with plenty of gum trees to give you shade. High at the top of the waterfall is a lookout where you can see views of the diverse landscape of the southern most parts of Kakuda National Park. Also in Kakudu National Park, Jim Jam Falls is nested deep inside a gorge, the spectacular falls drop an extreme 200m to the natural swimming hole below. Accessible by 4WD, this huge plunge pool must be seen to be believed as it is extremely awe inspiring! 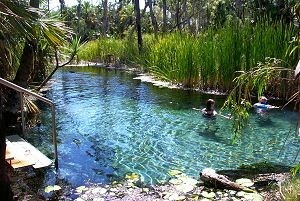 Set amongst palms and tropical woodlands in the Elsey National Park towards Katherine lies the secluded Bitter Springs with its serene waterholes that are naturally heated by spa-like thermal springs. 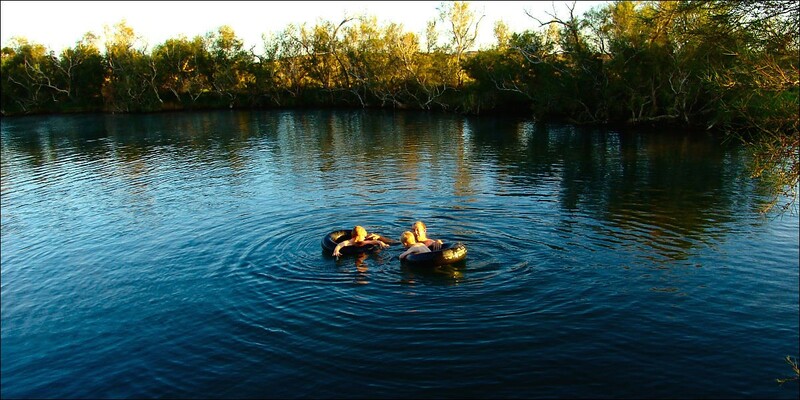 Ellery Creek Big Hole is a spectacular outback waterhole where you can view the beauty of untouched nature. It has formed over thousands of years where the Ellery Creek cuts through the West MacDonnel Ranges. This waterhole is a beautiful well balance area of water and geological rock formations for everyone. Edith Falls is perched among the red rock landscape of Nitmiluk National Park, near Katherine Gorge. Two separate pools are in the top or bottom of the falls. Nearby is the secluded Sweetwater Pool where you might find some turtles to swim with! 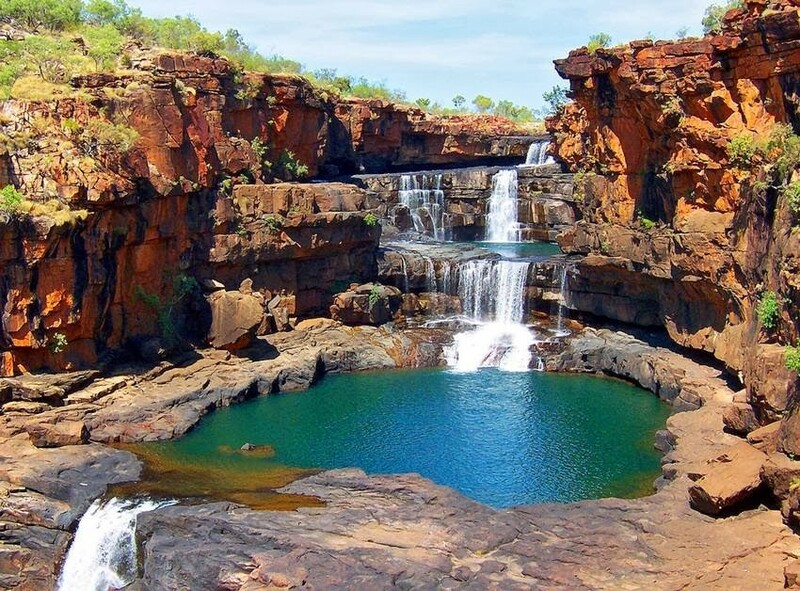 About an hour’s drive from Perth is an impressive four tiered waterfall in the remote Kimberley Region and the pristine swimming holes of Mitchell Falls. The layers of fresh water spills into different swimming holes as the water tumbles from one to the next. You can cool of in the surroundings of a rare harmony of wildflowers, wildlife and rugged red rock. Mitchell Falls second tallest waterfall in the state at a height of 80 and even more spectacular in the wet season. Its backdrop of a long red cliff leading to Mitchell Plateau which is unlike anything else along the Gibb River Road you take before you get there. Serpentine Falls flows down the 15m of polished granite rock face to create a deep swimming hole nestled below. A perfect spot for a midsummer dip with the surrounding native bushland and hills, filled with the colour of wildflowers. Affectionately known as ‘Serpy Falls’ this cascading water fall can be found in the Serpentine National Park, about 50km south east of Perth. 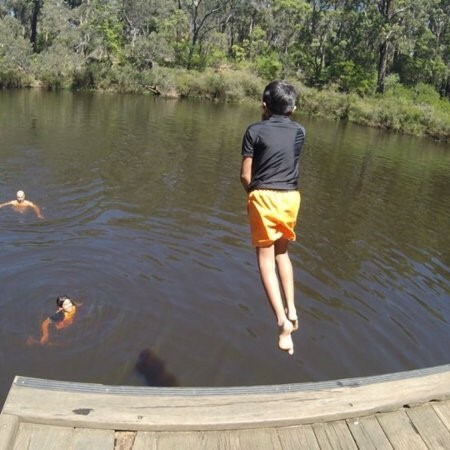 Barrabup Pool is situated 8km west of Nannup of Mowen Road. This deep naturally formed swimming hole is a peaceful location and a relaxing setting to unwind. Surrounded by bushland and native trees it is found in St Johns Brook Conservation Park along the Old Timberland Trail. There is a platform for jumping off for the more adventurous and year round free camping. 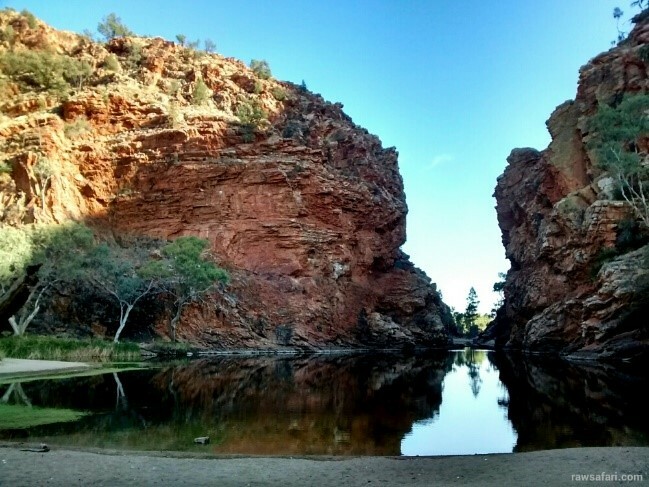 Along a beautiful walk within El Questro Wilderness Park in Kimberley is the Ancient Emma Gorge. This spectacle of the gorge and its deep swimming hole below is worth the challenging hours walk to get there. The red rock cliffs surrounding the 65m high waterfall stave the pool of sunshine so the waterhole is very cold. The crystal clear water and the setting of the secluded waterhole makes it an unforgettable place to swim. Lane Pool is another hidden wonderland which is begging you to swim in. Lane Poole Reserve sits in the tranquil waters of the Murray River in the Northern Jarrah forest. The more adventurous can canoe down the Murray as it meanders through forest clad valleys making it an enchanting place to visit. 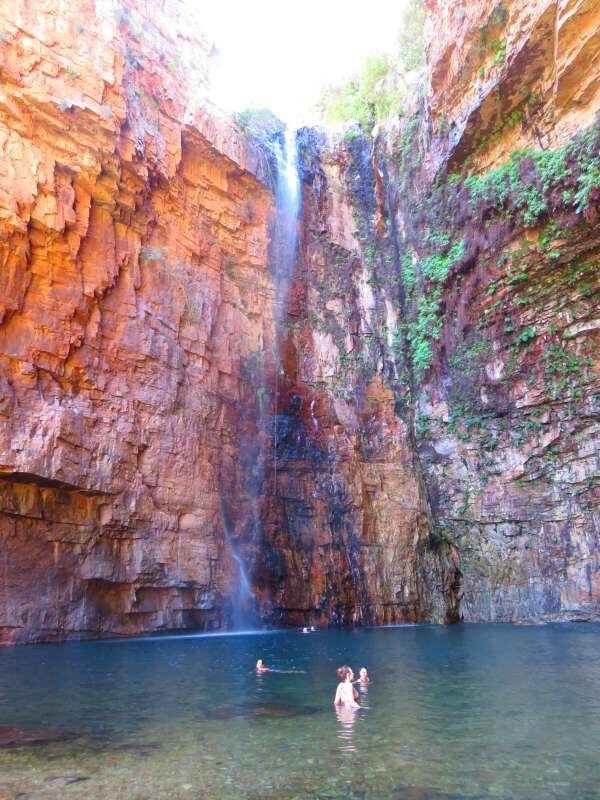 In the gorges of Karijini National Park behind the gushing waters of Fern Pool Falls, you will discover Fern Pool. Surrounded by lush greenery and dusty red rocks woodland, these cool turquoise waters can be found at one end of Dale’s Gorge. 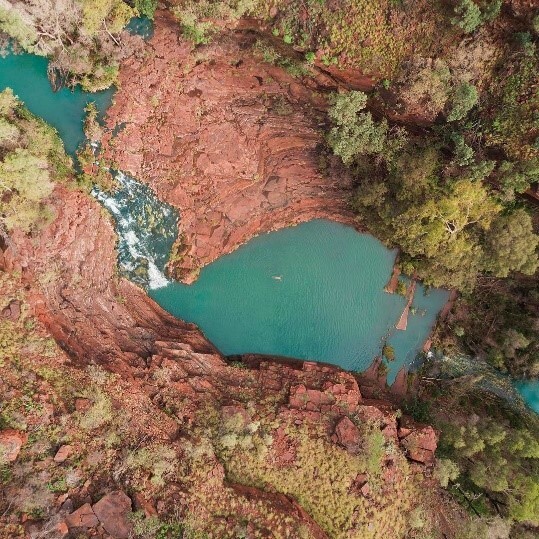 There are many swimming pools along the different gorges in the Karijini National Park but be prepared for challenging walks but Fern Pool one of the easiest to get to.